Norman Osborn is a man with numerous personal vendettas and Peter Parker is atop that list. But a close (and getting closer) #2 on Osborn's list of enemies would certainly be Tony Stark. After the Skrull's invasion was defeated and Starktech found to be the vulnerability that allowed the invasion to occur, Osborn's delight could not have been greater. Especially since Norman became the hero against the Skrull invasion and in the aftermath he was given Stark's position as the head of S.H.I.E.L.D. But Osborn decommissioned S.H.I.E.L.D. and created his own peacekeeping task forces, which he called H.A.M.M.E.R. As Stark left the position in shame, Osborn was anxious to take all that was under Stark's control, namely the database that housed all the information from the Superhuman Registration Act (ie. the secret identities of many costumed heros). It should be mentioned that this story takes place in the era of Spider-Man's Brand New Day, which involved Spidey creating a mindwipe that erased everyone's knowledge of his alter ego. Osborn was very interested in rediscovering that information. Unfortunately for Osborn, Stark took that database with him...inside his brain. 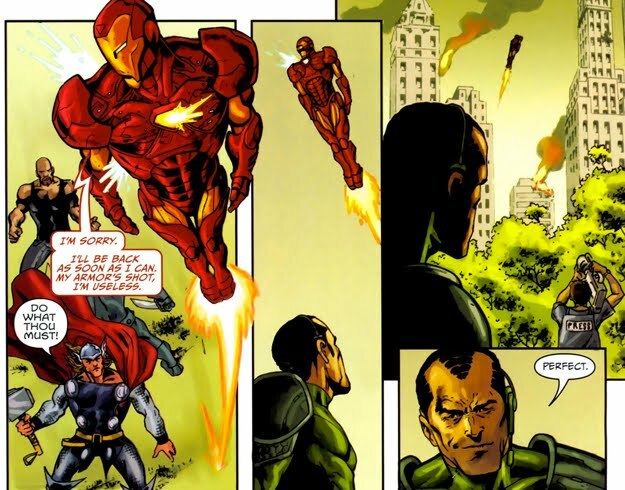 The Extremis armor that Stark used to pilot Iron Man allowed for the expansion of his neuronal capacities, meaning he could store an entire database inside his head...it also meant that now Norman really wanted Stark's head on a platter.To achieve that goal, Norman began to wage a war against Stark and his team, which included Pepper Potts and Maria Hill. 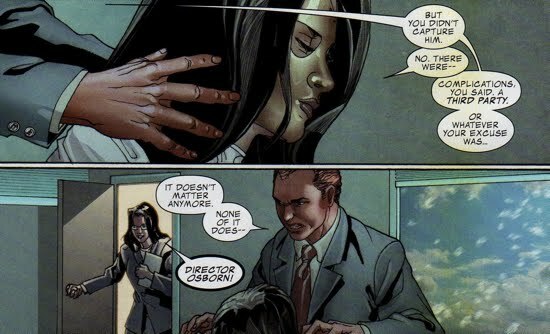 Osborn attacks Stark and Hill publicly, citing that his team uncovered S.H.I.E.L.D. 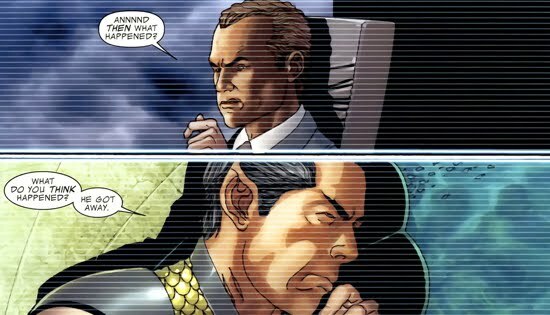 Executive Memo #262, a document that indicated that Hill and Stark had 'actionable intelligence' suggesting a Skrull invasion was imminent. After this decree, Osborn requested that Hill and Stark turn themselves in to authorities immediately otherwise the manhunt (and womanhunt!) would continue. There were no official charges brought against Stark, he was simply requested by Norman to turn himself in publicly at Restoration Park...Stark never showed, so the hunt began. 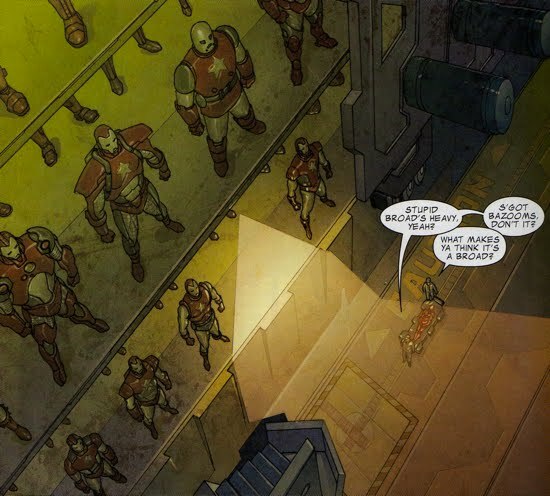 Tony began destroying all of his armories worldwide, and after War Machine tried to convince Stark to turn himself in, Tony refused. The two then staged a battle that led to Stark falling deep into the ocean, so Osborn sent his #1 ocean-guy after Stark, Namor. Tony is able to outsmart Namor and although he takes a beating from the Sub-Mariner, he's able to get away. 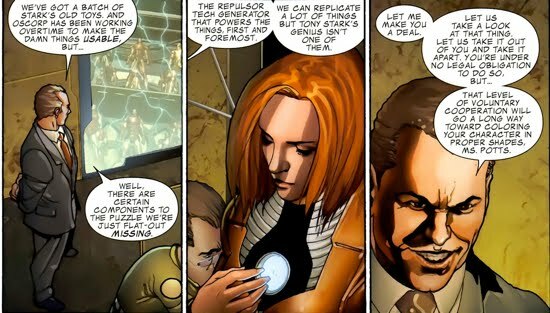 Before Stark went on the run he designed a Stark-tech armor suit for Pepper Potts, which she used to escape Osborn's forces. But Norman wanted her brought to 'justice' as well so he has H.A.M.M.E.R. monitor her location as well. They eventually find her and they realize that her Stark-tech suit is not weaponized. Norman did not believe that to be true so he ordered that a nearby commercial plane be shot down, so that he can test Potts' capabilities. He used the phoney excuse that he received intel that a Skrull sleeper agent was on that flight. Potts was able to safely land the plane, but once she was back on land, H.A.M.M.E.R. forces had her arrested. Once in custody, Osborn questioned Potts for Starks whereabouts, but she was not very helpful because she had no idea where he was. After failing to extract Stark's locale, he turned to a second request for Potts, her suit. He wanted to take her suit to gain insight into Stark's genius, but Potts would not concede and since she was under no legal obligation, Osborn was forced to free her...after he threatened her safety. After using Namor to catch Stark unsuccessfully, Norman was forced to use another member of his cabal, The Hood. Being the kingpin of a new crime syndicate, The Hood has operatives all over the globe. Shockwave (aka Lancaster Sneed), one of The Hood's men, finds Stark but fails to apprehend him, Osborn becomes convinced The Hood has a team full of scrubs. Frustrated, Osborn requested that The Hood's partner (and former love interest of Stark), Madame Masque, speak with him privately. 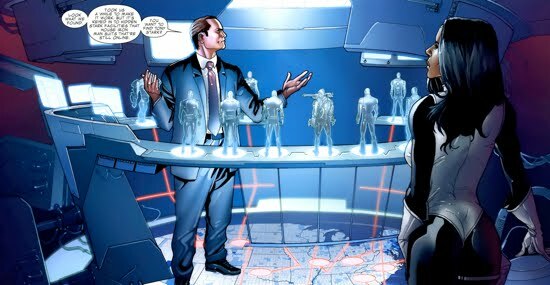 Osborn showed Masque the cache of Stark-tech that is still functional, he suggested to her that Stark may visit one of these caches and that that would be the key to finding him. Masque accepted Norman's proposal. Meanwhile, Pepper Potts made her way Russia, tracking Stark's signal. After Victoria Hand uncovered that information, Norman contacted Russian Colonel Bukharin. He petitioned Bukharin for permission to enter Russian air space to shoot Potts down. The colonel declined and Norman was not very pleased by the colonel's reponse. 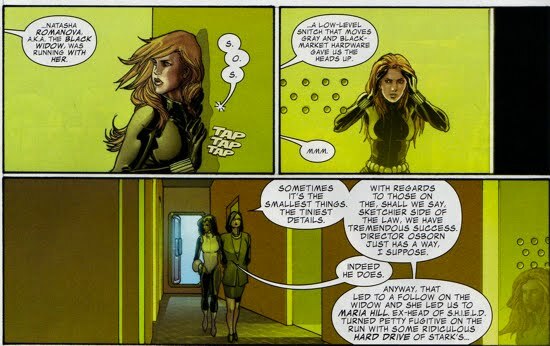 Eventually Madame Masque caught up to both Stark and Potts, taking them both into custody. But her jealousy got the best of her after she saw Stark kissing Potts, so she decided to torture Potts while Stark watched. Masque gets bested though, as Pepper is able to activate her Stark-tech and free both she and Tony. 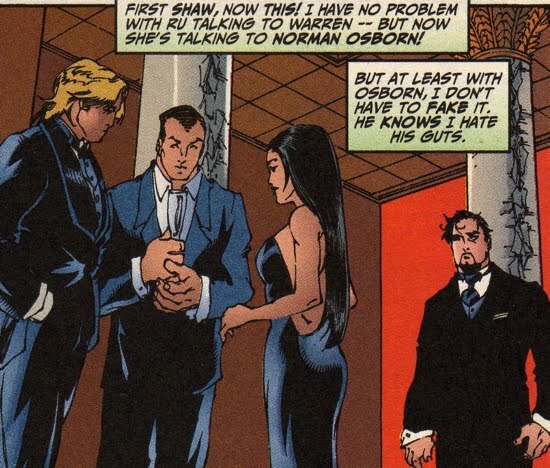 When Masque returned stateside, Osborn was not very pleased with her performance and he sensed that she was lying about how Tony was able to escape. 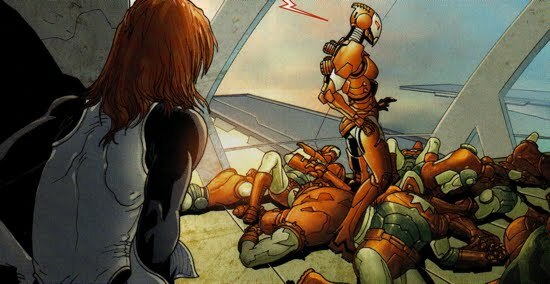 Masque erroneously reported to Osborn that she'd killed Pepper Potts and recovered her armor, but Pepper was obviously not dead. Norman was going to strangle Masque because of her failure when he was interrupted by Victoria Hand. It would have been interesting to see what would have happened had they not been disturbed. With confirmation of Stark's presence in Russia, Norman reestablished contact with Colonel Bukharin, but this time he did not ask for permission. 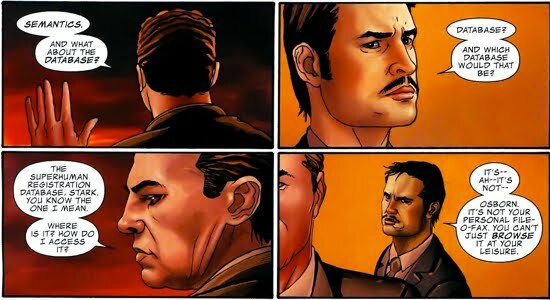 He told the colonel that in exchange for a tip involving illegal Russian nuclear weapons, Osborn wants Stark. The colonel is forced to oblige. 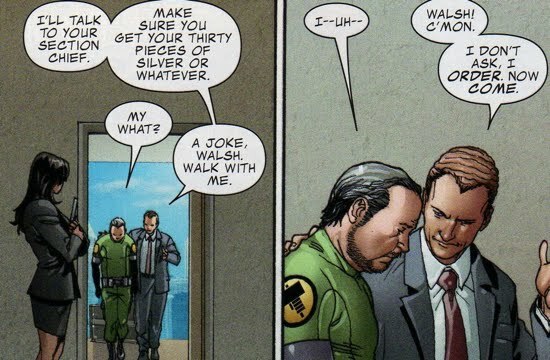 Tony escaped again though, this time to Afghanistan and Osborn's team is able to find his location. Osborn cannot go near Stark on Afghani territory, so he must wait until the leaves their airspace. Christopher Walsh is the H.A.M.M.E.R. 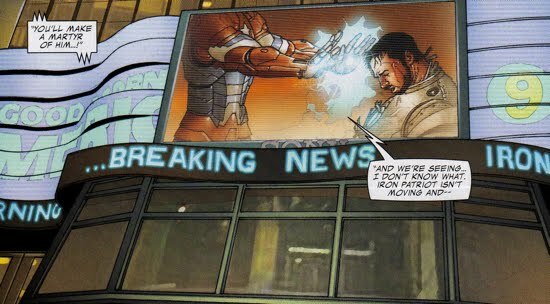 agent responsible for finding Stark's signal, and he is placed in direct communication with Norman (who is in his Iron Patriot armor) as he waits for the go-ahead. 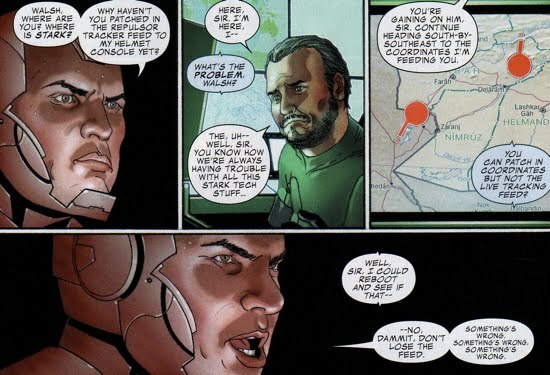 Walsh had a change of heart and decided to not help Norman, he began feeding him bad information on Stark's location. Walsh's supervisor, Agent Gormley, recognized what his subordinate was doing and immediately took over command and had Walsh placed in detention. After receiving the proper coordinates on Stark, the Iron Patriot could taste victory over his hated nemesis. Once he reached Stark, Osborn unleashed a storm of missiles and repulsor blasts, neutralizing his foe. Stark fought back slightly, but Osborn continued to pulverize Stark. Unfortunately for Norman, he could not enjoy his success for long. 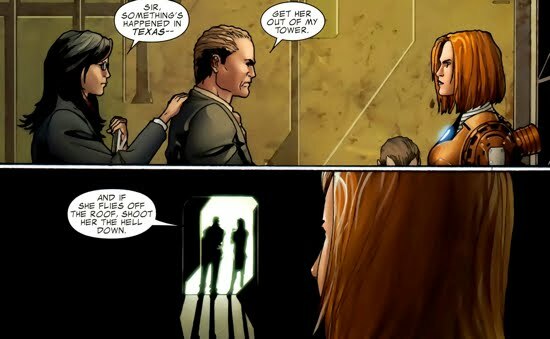 Pepper Potts' suit, nicknamed J.A.R.V.I.S., contacted the global media and made them aware of the fight between Norman and Tony. Suddenly, their battle was broadcasted live across the globe. Just as Norman was about to deliver his kill shot, Hand contacted him, telling Osborn it appeared as though he was going to kill Stark on live TV in cold blood. Norman is forced to pull back, but he returned to his H.A.M.M.E.R. headquarters with a nearly brain-dead Tony Stark. Osborn informed his medical staff that he wanted them to pull the plug on Stark's life support. They tell Osborn that they cannot because they do not have the power of attorney to do so, Stark's power of attorney lies in the hands of one Donald Blake...aka Thor. Stark was able to evade death. This was certainly not the end of the Stark/Osborn war, not by a long shot. Score this as a half victory for both of them, since Osborn was able to beat the snot out of Stark...but Stark was able to not be killed whilst completely vulnerable. 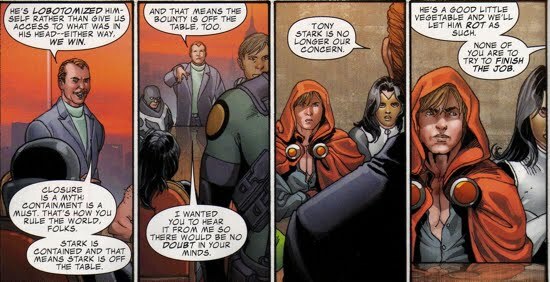 Stark would eventually have a key role in taking Norman down from power during his siege on Asgard, but that is the subject of a different section. At this point, Osborn gloated that he had defeated Stark. Stark lobotomized himself in an effort to purge the Superhuman Registration Database inside his brain, to keep it away from Osborn...a temporary win for the 'former' Green Goblin. When Norman thought he had access to the Superhuman Registration database, the first name he searched was Spider-Man. That was very satisfying to see, Norman made hundreds of enemies during his tenure at the top, but it was good to see that Spider-Man was still #1 on his list. 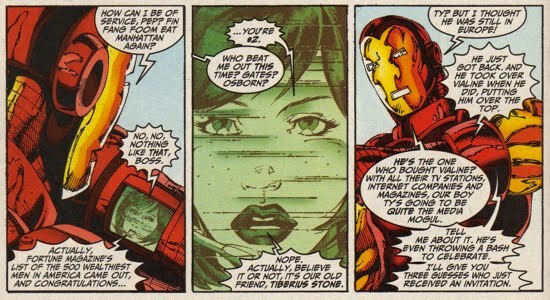 Throughout Osborn's hunt for Stark, he became frustrated trying to replicate certain facets of Stark-tech. Osborn even conceded that he could not mimic Stark's genius, it was interesting to see Norman concede that point aloud. With Norman's pride and his hatred for Stark, one might think he'd keep that to himself. Here's a more detailed look at Norman's war chest...a collection of various Iron Patriot-ized Stark-tech suits. He never wore any of them, but it was interesting to see he did make more than one version of his suit. 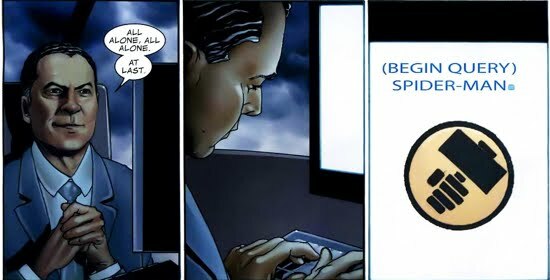 The second panel below shows Pepper Potts' suit (aka Rescue) destroying Osborn's arsenal, so it's unlikely Norman will break out any of these other suits any time soon. Plus, we know Norman struggled to replicate the necessary Stark-tech for operating Stark's arsenal. Just to prove Stark's negative feelings toward Osborn prior to his Dark Reign, here's a panel...can't get much clearer than that! But of course, underneath hate there's usually some respect. Here's Stark showing a little respect for Osborn, citing him as a potential candidate for the #1 spot on the 500 Wealthiest Men in America list. 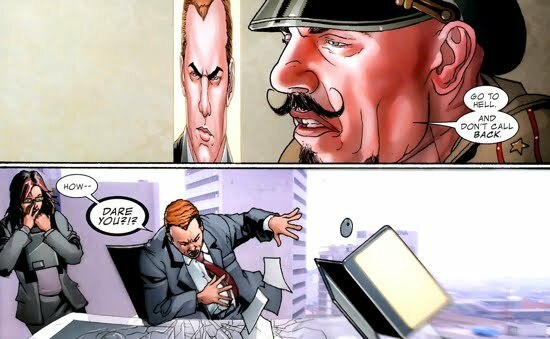 So Stark certainly viewed Osborn as a potential threat...at least a businessman, certainly not as a person.